FILE - The commander of NATO and U.S. forces in Afghanistan, U.S. Army Gen. John W. Nicholson, speaks at Task Force Southwest atn Shorab military camp of Helmand province, Afghanistan, Jan. 15, 2018. The top U.S. military commander in Afghanistan said a combination of religious, social, diplomatic and military pressure will be applied to the Taliban this year to force them to start negotiating for peace in the war-torn country. General John Nicholson, who is leading U.S. and NATO forces in Afghanistan, told a group of journalists Monday in Kabul the multi-pronged approach would be different from past years. "There will be religious pressure applied to the Taliban with the ulemas hosted in Indonesia and elsewhere to strip away the religious legitimacy for jihad in Afghanistan," Nicholson said, referring to Muslim scholars with expertise in Islamic law. In January, Indonesia, the world's most populous Muslim majority country, proposed setting up a committee of ulemas from Indonesia, Afghanistan and Pakistan to help resolve the ongoing conflict in Afghanistan. Explaining the other parts of the strategy, Nicholson said the Taliban would feel the social pressure when Afghans elect their own leaders later this year in parliamentary elections, whereas the U.S. South Asia policy is applying diplomatic pressure on neighboring Pakistan to use its influence on the Taliban to facilitate reconciliation inside Afghanistan. Nicholson pointed to the increased number of U.S. troops and airpower in the country, as well as the strengthening of Afghan special forces and air force, which he said would add to military pressure on the Taliban. "At the same time, there will be a strong effort in the area of advancing the reconciliation process," he said. President Ashraf Ghani last month offered the Taliban the opportunity to come to the table and renounce violence in return for political recognition, the opening of an office in Kabul, jobs, and other perks. He said there were no preconditions for peace talks. FILE - Delegates attend the second Kabul Process conference at the Presidential Palace in Kabul, Afghanistan, Feb. 28, 2018. Afghanistan President Ashraf Ghani is calling on the Taliban to take part in peace talks. The Taliban have not responded to the offer, leading to speculation they might be considering it. According to the office of Afghan CEO Abdullah Abdullah, Pakistan's National Security Adviser Nasir Janjua told him in a meeting that after Ghani's offer, the Taliban no longer had any excuse to continue fighting. Pakistan's ambassador to the United States, Aizaz Ahmad Chaudhry, also indicated his country would like to see the Taliban rehabilitated. A senior Pakistani military official, who spoke to a group of reporters on condition of anonymity, maintained that his country was pushing the Taliban to be a part of the talks. "We are sincerely trying to persuade them" and their allied Haqqani group to join the Afghan reconciliation process, he said. The Taliban, meanwhile, have written an open letter to the American people calling for direct dialogue with the U.S. government. 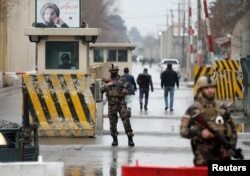 The United States has said any talks would have to be Afghan-led. 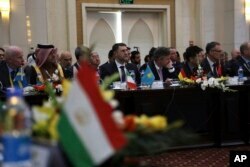 Separately, a spokesman for the High Peace Council, a group heading efforts to end the conflict in Afghanistan, said no date was confirmed for the Indonesian initiative. In a briefing with journalists after a council meeting, Akram Khpalwak urged the Pakistani clerics to participate, but indicated their doing so was not confirmed. Khpalwak said if the Taliban responded negatively to Ghani's offer, their current offices in Doha, Qatar, could be closed down. Violence in Afghanistan has not subsided. Recently, a NATO convoy near Kandahar and a foreign security firm in Kabul were targeted, leading to casualties, and in another incident, the Taliban captured a district office in Farah province before Afghan forces pushed them back. FILE - Afghan security forces keep watch at a check point near the site of a suicide attack in Kabul, Afghanistan, Feb. 24, 2018. Several high-profile attacks on Kabul this year have also exposed security vulnerabilities of Afghan and foreign forces. One such attack in January killed close to 100 people. Days before, an attack on one of Kabul's luxury hotels left more than 20 people dead, including many foreigners. The pressure on Pakistan apparently has not yielded the desired results. "While there have been actions to date, these actions have not reduced violence; these actions have not produced an end to sanctuaries and support inside Pakistan," Nicholson said.